Lake Elsinore, CA – On-going studies, administered by the Lake Elsinore & San Jacinto Watersheds Authority (LESJWA), demonstrate a continued effort to keep Lake Elsinore in balance. Established to improve water quality and ecology in the watersheds, LESJWA seeks solutions to accomplish these goals. Recent study results conducted by Dr. Michael Anderson, Associate Dean at the University of California, Riverside, identified historical challenges plagued by the lake, as well as current lake water quality management programs and their effectiveness. Included in the lake study, hydrological and climatic conditions were collected and evaluated, demonstrating factors that can vary dramatically and alter the lake over time. The data collected was used to create models to understand how the factors can affect lake levels and quality. With hot summer temperatures quickly approaching and a constant need to elevate water levels remaining as a concern, the lake is likely to experience a possible die-off of vital fish populations causing an ecological imbalance, as was witnessed last summer. The lake receives recycled water from Elsinore Valley Municipal Water District; however, one critical factor studied was the lake’s salinity, as a result of the supplemental water source. Lake water levels, evapoconcentration, and watershed inputs all effect salinity concentrations, in addition to natural nutrients that flow to the lake, due to its location at the end of the watershed. High levels of salinity can impair sport fish and beneficial zooplankton reproduction. It negatively alters the ecology and water quality of Lake Elsinore. The key to minimizing high salinity levels requires significant circulation of lake water with outflows of high saline lake water leaving the lake as stormwater enters the lake. Additional factors studied include increased concentrations of chlorophyll-a, green pigment tested in lakes to determine algae growth, and their relationship to the addition of recycled water to the lake. While the recycled water supplements did not demonstrate a significant correlation with an increase in chlorophyll-a, periods of low lake levels did show increased concentrations. There were slightly lower concentrations due to the recycled water additions. The supplementation of recycled water to Lake Elsinore aids in preventing the lake from completely drying out. Aquatic life in the lake requires oxygen to survive. Microscopic bubbles of oxygen in water are known as dissolved oxygen, a critical element to maintaining healthy water quality. While the effect of the added recycled water supply on the mean dissolved oxygen levels are limited, the recycled water does provide an increased range of water column dissolved oxygen concentrations. This means that in certain depths studied within the lake there has been proof that the supplementation of the recycled water has contributed to an increase in dissolved oxygen levels. 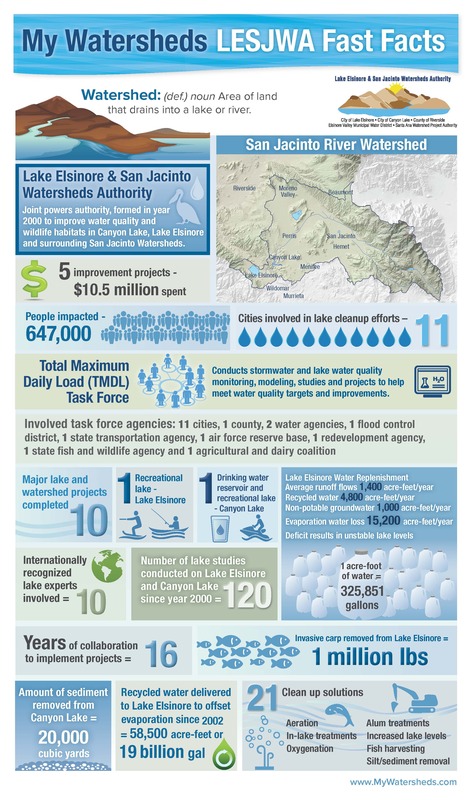 Funding for these essential studies and projects, which help in the improvement and monitoring of Lake Elsinore’s water quality and ecology have been provided by a State grant, the Santa Ana Watershed Project Authority – One Water One Watershed (OWOW), and by the Lake Elsinore and Canyon Lake Total Maximum Daily Load (TMDL) Task Force, which consists of cities, the County of Riverside, agriculture and dairy coalitions, and other organizations in the San Jacinto River watershed. LESJWA is a joint powers authority entrusted with state and local funds to improve water quality and wildlife habitats in Lake Elsinore, Canyon Lake and the surrounding San Jacinto watershed.